Based on United States Environmental Protection Agency (EPA) reports, during the dryer seasons, as much as 50% of a home's water use may go to landscape irrigation, and more than 50% of this landscape water is wasted due to over watering. This is because, traditional irrigation controllers do not take into account weather conditions and will activate the sprinklers even when it is not needed. This not only wastes water and affects your wallet, but also hurts the health of the plants in your yard or garden. Lately, smart irrigation system controllers have become very popular. These devices are designed to easily replace existing traditional sprinkler controllers, and once they are connected to your home's Wi-Fi, they allow you to manage optimally all your yard's zones watering requirements (i.e. when to water, where to water and how to water), minimizing water waste. They achieve this by gathering from various weather services current local weather information as well as accurate forecasts and then generating a perfectly optimized watering plan for your yard by automatically modifying the zone specific schedules you had set up using the free App they provide. In addition, these smart controllers provide you with the convenience not to have to get out to the yard or run down to the basement or the garage to control your sprinklers: once you download the app associated with the smart controller into your smartphone, you will be ready to monitor and control your sprinkler system from anywhere and at anytime. This article will compare RainMachine, Rachio and Blossom smart sprinkler controllers. These were the most popular among Amazon customers at the time this article was written. All three controllers considered here support Wi-Fi connectivity and therefore you can use your smartphone to control remotely your controller once the unit is connected to your home’s Wi-Fi. All three products provide you with a free mobile App you can download to your smartphone to setup and control the irrigation of your zones. With Rachio and Blossom, the mobile App is also required to connect the controller to Wi-Fi. With RainMachine that is optional, as you can connect it to your home's Wi-Fi by simply using the touch screen on the unit itself. iOS and Android mobile Apps are available for all three controllers. But note that RainMachine and Rachio also have traditional web apps and therefore they can also be controlled from your desktop computer or laptop which is not the case with Blossom that can be controlled only from your mobile app. Powerline is a bridging technology, often useful for extending the reach of a home network to places where your wireless coverage is poor, or where you need the fastest connection. Because the reach of Wi-Fi is limited, Blossom uses Powerline technology to turn any electrical outlet into an Internet connection making range essentially limitless. With RainMachine everything you can do with your App from your smartphone or laptap can also be done locally on the unit itself using the 6.5" touch screen. Having a touch screen also improves user experience and provides local control in case your smartphone is not available for any reason. 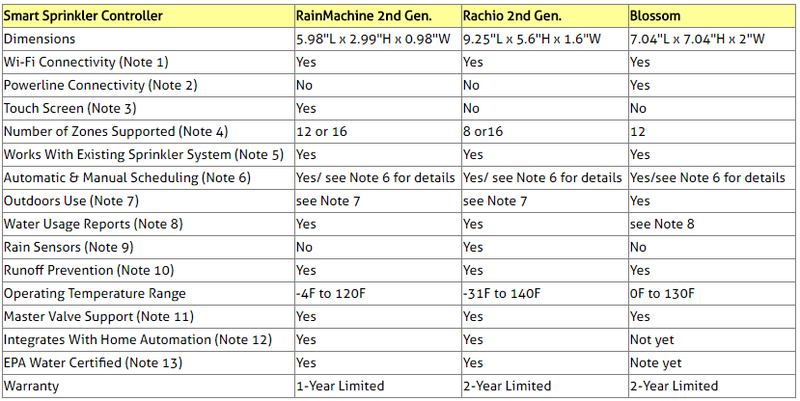 There are two versions of RainMachine 2nd Generation. One that supports up to 12 zones and another that supports up to 16 zones. There are two versions of Rachio 2nd Generation. One that supports up to 8 zones and another that supports up to 16 zones. The latest Blossom can support up to 12 zones. For RainMachine and Rachio, when you click the product link images in the Amazon section below, you will be offered both versions to choose from. These smart controllers can replace existing 24VAC sprinkler systems. Rachio also uses Cloud servers to configure automatically each zone's optimal watering cycle based on input entered by you on zone specifics and based on local weather forecasts from multiple weather services. As different weather forecasts are received, Rachio will adjust automatically your watering schedule to the exact needs of your yard based on past, present and future weather, as well as forecast rain delays. ​​If preferred, you can take control and easily customize your own schedule. Each zone can be uniquely configured with input you enter on vegetation type, soil type, slope angle, level of sun exposure, sprinkler nozzle type and the particular watering schedule. You can specify times and dates for when your schedules should run. In addition. retrieval of local weather data (accessed from the Cloud) can be activated for automatic adjustment of the zone's watering cycle. You can also enter a name and a picture associated with each zone, so that when you are displaying zone information or controlling the zones, you know you're working with the right zone. You can also provision the zone as enabled or disabled. Disabled zones will not be available when adding an irrigation schedule, and no watering will happen for disabled zones. When you create a schedule for a particular zone, you can select the Smart Cycle feature to prevent runoffs. With this feature turned on, Rachio will break up the total watering time for each zone into a number of cycles. For each cycle, a zone is watered for a period of time that matches the infiltration rate of your soil. During this process, it's important that the soil in each zone gets enough time to absorb the water, and therefore the controller schedules at least 30 minutes between each watering cycle on the zone. You can also turn on the Weather Intelligence feature, which uses temperature and rainfall related forecast data to skip your schedules when appropriate, helping you save water whenever it's possible to do so. In the event of Wi-Fi outage, the controller’s memory retains the last saved schedule received from the Rachio Cloud and maintains the schedule until an update can be downloaded. Note that the system’s settings can be overridden and manually controlled from your App at any time. 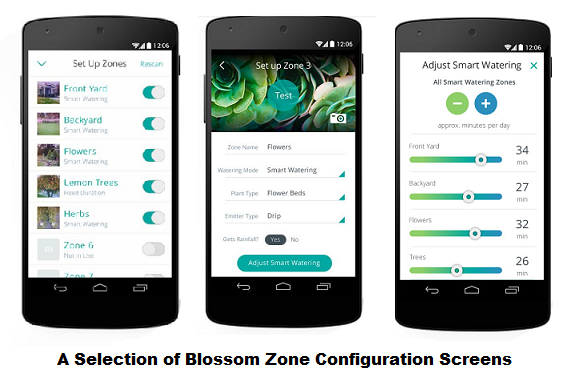 Blossom uses Cloud servers to configure automatically each zone's optimal watering cycle based on input entered by you on zone specifics and based on local weather forecasts from multiple weather services. Each zone will have it’s very own watering needs, and Blossom is built to learn over time a customized watering pattern for your yard. Note that if preferred, you can take control and easily customize your own schedule. Each zone can be uniquely configured with input you enter on vegetation type, sprinkler nozzle type and the particular watering schedule. You can specify times and dates for when your schedules should run.​ In addition, retrieval of local weather data (accessed from the Cloud) can be activated for automatic adjustment of the zone's watering cycle. You can also enter a name and a picture associated with each zone, so that when you are displaying zone information or controlling the zones, you know you're working with the right zone. Once a zone is configured in the App, it can be tested with a quick sprinkler on/off button, so you know you have the correct zone set up. In addition, you can adjust the watering amount per zone with a simple swipe. The Blossom controller will revert to a fail-safe backup schedule consistent with your settings when it cannot communicate with the Cloud servers. The schedule will be updated immediately when the unit is back online. Like Rachio and Blossom, RainMachine also programs automatically each zone's optimal watering cycle using the zone specific input entered by you and the local weather forecasts from multiple weather services, but as opposed to Rachio and Blossom, it doesn’t rely on a Cloud based service to store and process all the zone and weather specific data. Though it gets weather related info from Internet, all zone related data and downloaded weather forecast information is kept in the controller itself and not on Cloud based servers. Therefore, RainMachine can properly work even when your Internet connection temporarily goes down. Because the controller downloads forecast data for up to 7 days, it can continue normal operation several days with intermittent Internet failures using the downloaded forecast data. If a week later the Internet is still down, the unit will follow your configured program to the letter, without making weather based adjustments. Each zone can be uniquely configured with input you enter on vegetation type and the particular watering schedule. You can specify times and dates for when your schedules should run. You can also enter a name associated with each zone, so that when you're displaying zone information or controlling the zones, you know you're working with the right zone, but no pictures can be entered for zones. In addition, retrieval of local weather data can be activated for automatic adjustment of the zone's watering cycle. You can also provision the zone as active or inactive, the default being active. If the zone is set to inactive, no watering will happen. Currently no irrigation program adjustments are made based on parameters such as slope/sun/shade/sprinkler type. ​In addition, you can turn on the Historical Averages feature for each zone to allow RainMachine to adjust watering time based on historical daily averages for your area. So, if no Internet weather data is available, it stills saves you some water by using a locally stored historical averages table. ​Both Forecast Data and Historical Averages can be disabled for a specific zone, in which case RainMachine will act as a regular sprinkler controller, watering the amount you programmed for that zone, without any adjustment. When you create a schedule for a particular zone , you can also select the Cycle & Soak and Station Delay features. Cycle & Soak allows you to avoid water waste. Each soil type can absorb a specific amount of water in a time interval. In order to avoid runoffs, you can split the watering interval in multiple cycles, allowing a soak time between cycles. Station Delay allows you to specify an amount of time between two consecutive zones, to accommodate specific irrigation systems that require time to fill up water tanks or build up water pressure. To use RainMachine outdoors, you will need to obtain an outdoor enclosure that will protect your controller in all weather situations (see Amazon section below). To use Rachio outdoors, you will need to obtain the optional Rachio outdoor enclosure that will protect your controller in all weather situations (see Amazon section below). Blossom is engineered to withstand the elements, so it’s mountable indoors or outdoors with no extra enclosure required. With RainMachine, touching the screen you can get a graph of the percentage watering time for each day. Rachio app will let you know the total quantity of water used for all zones combined​. With Blossom, the user can only see from within the Blossom app how long the last couple of cycles irrigated. A rain sensor is a switching device activated by rainfall. It causes the system to shut down in the event of rainfall. Rain sensors are useful as a sort of "insurance policy" against inaccurate data from your local weather station(s). Note that Rachio does not need sensors to operate, but the unit can take the input from existing sensors, interrupting the irrigation activation signal. ​RainMachine and Blossom do not have dedicated connectors for a rain sensor. RainMachine's Cycle & Soak mode allows you to avoid water waste. Each soil type can absorb a specific amount of water in a time interval. In order to avoid runoffs, you can split the watering interval in multiple cycles, allowing a soak time between cycles. Rachio features a Smart Cycle mode that breaks up your schedule into smaller periods to maximize soil absorption rate and prevent runoff. For each cycle, a zone is watered for a period of time that matches the infiltration rate of your soil. During this process, it's important that the soil in each zone gets enough time to absorb the water, and therefore the controller schedules at least 30 minutes between each watering cycle on the zone. Blossom also has a soak-cycles feature which will allow you to water a zone multiple times per day. You can configure that zone to water up to 5 times a day and choose soak time in between the cycles. A master valve is an electric valve installed at the supply point which controls water flow into the main piping system. When this valve is closed water will not be supplied to the irrigation system. All three controllers considered here support master valve/pump relay. Both RainMachine and Rachio can be integrated into home automation systems. This is not available yet with Blossom. RainMachine and Rachio are EPA WaterSense Certified. EPA WaterSense certified smart watering, including automatic rain delays, can save users over 50% of their outdoor water use. Plus, it is eligible for rebate options up to 100% of retail value. ​For exact price information for these three smart controllers, please refer to the Amazon section below. So which of the three smart sprinkler controllers to get? All three smart irrigation controllers considered here will avoid wasting water, save your money and keep your yard’s vegetation in good health by modifying your irrigation schedules with local weather information obtained from various weather forecast resources via Internet. They are also very easily installed. If you already have a traditional sprinkler system, all you need to do is disconnect the zone wiring, remove the old unit, attach the new controller, re-connect the wiring and provision the smart controller into your home's Wi-Fi network. If you don't use a smartphone or a computer, you should definitely go for the RainMachine which is the only one of the three that is equipped with a touch screen and allows you to do everything locally on the unit itself. This includes connecting the controller to your home’s Wi-Fi as well as provisioning and controlling your zones. Of course, if you have a smartphone or computer, you can use the RainMachine App to do everything remotely without using the touch screen. But having a touch screen, improves user experience and provides local control in case your smartphone is not available for any reason. When Internet is down, it can still modify your schedules using the already downloaded forecasts. Since all your private zone related info is kept on the controller, no one can have access to it. RainMachine also provides special zone provisioning modes to prevent runoff and to delay irrigation between zones to accommodate specific irrigation systems that require time to fill up water tanks or build up water pressure. It also allows you to adjust watering duration in relation to rainfall and temperature, integrates with home automation systems, and it can be controlled not just from your smartphone, but also from your desktop computer or laptop. It is also EPA certified. ​Note however, that RainMachine can not be used outdoors unless you buy an outdoors controller box cover to protect it from harsh weather. It doesn't allow you to enter a picture associated with a zone (but it does allow you to customize each zone by naming each zone). It also comes with a 1-year limited warranty as opposed to 2-year for the other two controllers considered here. It is already protected against harsh weather, so you don't need to buy a weather protection cover if you want to install it outdoors. ​It can optionally be used with Powerline bridging technology that extends the reach of a home network to places where wireless coverage is poor or where you need the fastest connection. It also allows you to enter a picture associated with each zone so you know you are working with the right zone when making changes or reading data. However, it is not yet EPA certified (they are in the process of doing it), can not be integrated yet with home automation systems, and can not be controlled from a desktop or laptop computer. It also relies on Cloud servers for producing your zone specific schedules which means that when Internet is down the last saved irrigation schedule will be used until the system is back online. ​It allows more detailed zone provisioning taking into account additional parameters such as plant type, soil type, slope angle, level of sun exposure and sprinkler nozzle types making the zone tailored schedules all the more accurate. It provides quantitative water usage reports (not just water usage percentages like RainMachine does). If desired, Rachio can be used with rain sensors which are useful as a sort of "insurance policy" against inaccurate data from your local weather station. They simply cause the system to shut down in the event of rainfall. It can be controlled not just from your smartphone, but also from your desktop computer or laptop. Rachio also provides a special zone provisioning mode to prevent runoffs, is EPA certified and comes with a 2-year warranty. Note that, like Blossom, In the event of Wi-Fi outage, the controller’s memory retains the last saved schedule received from the Rachio Cloud and maintains that schedule until an update can be downloaded. Finally, keep in mind that at the time this article was written, RainMachine and Rachio had both received an average rating of 4.5 stars from Amazon customers, while Blossom had received 3 stars (out of 5 stars). ​Please click the product of your choice below for price information or to purchase. Note that when you click the RainMachine link image, you will get a choice of 12-zone and 16-zone controller, and when you click the Rachio link image, you will get a choice of 8-zone and 16-zone controller.